It’s not just a plea to an assailant: it’s a message to audiences at The Assembly Theatre and society at large. The toughest conversations around sexual assault occur behind closed doors, too late to spare one party. By dramatising these so vividly, playwright Amy Lee Lavoie and director Cristina Cugliandro make an important offer to the hard but necessary public conversation we increasingly insist on having. We meet Angie and Reed in what looks like an awkward but standard situation the morning after: Angie keen to shuffle him out the door and out of mind, Reed eagerly refusing to take the hint. When Angie’s patience wears thin, she asks him if he even realizes he assaulted her – blindsiding Reed, already planning the next stages of their affair. What follows is a messy, uncomfortable unravelling of what happened – what he did – and what it meant. What makes Leroy Street Theatre’s production of C’mon, Angie so valuable is that it isn’t so simple. As Lavoie puts it, Reed is not the “bad person who would abduct me in an alleyway” but a trusted acquaintance – as in the vast majority of assault cases – who could convince others (and certainly himself) that he’s just normal, a “good guy”, but one who refuses to read between the lines before he crosses them. The dramatic needs of the work align with the uncertainty that clouds these cases, as the question of what exactly Reed did hangs over the room almost until the end; viewers become both unwilling voyeurs and the inquisitors who always show up, demanding details that aren’t theirs to know. Above all, what if Reed was listening and just didn’t care? What answers are we hoping for? Ryan Hollyman’s Reed is complex enough for all this to work: convincingly sincere and desperately flawed from the start; switching seamlessly between angry and tender, assertive and vulnerable. He is charming-ish, in the manner of a man told that he’s charming all the time; we all know a Reed, and he will be distressingly relatable for a certain type of viewer. Hollyman is the ideal complement to Anne van Leeuwen, who channels Angie’s pain and anger into a remarkably compelling performance. Their partnership makes this production uniquely theirs, and it’s better for it, but the key lesson remains the same: the moral calculus doesn’t change if Reed is more ghoulish or Angie more demure, even if the audience’s reactions might. If the end offers a glimpse of contrition, it offers no easy closure. Who should fear Reed? What should happen to him? How should he proceed? These are left for the audience to ponder as they consider incidents in their own lives and the headlines. C’mon Angie succeeds in exploring themes that are widely relevant while fleshing out the deeply personal nuances of its own story. A surprising highlight of the play is its humour. For such a sensitive topic any comedy runs the risk of warping the mood beyond repair but here it offers a useful reprieve that lets the serious subject matter breathe. Sometimes it’s even funnier for its lack of relevance – the script doesn’t need to mock Burlington out of the blue, but why not?! – but other times it’s the perfect exclamation point for Angie’s rage or example of Reed’s boorish cluelessness. Guiding the audience through one end of the emotional register with such care while still flirting with the other is an impressive feat. 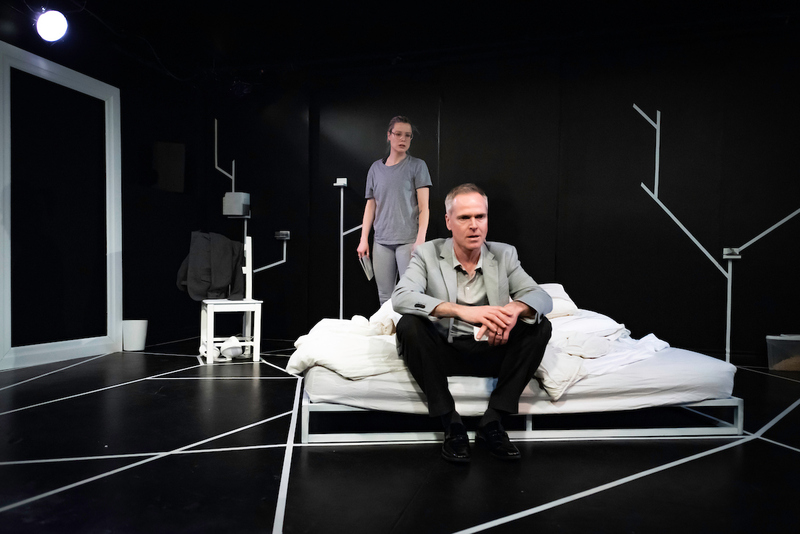 The play will provoke discomfort not only in viewers who ought to feel it, but likely those for whom Angie’s tale is all too relatable: the content warning here is not just in case. It’s an unfortunate compliment that the show portrays trauma realistically enough to disqualify some viewers from it. The intimate setting of the Assembly Theatre – styled convincingly as Angie’s barely liveable yet barely affordable apartment – makes that discomfort even more direct. For those who can make it out, C’mon Angie is well worth it.